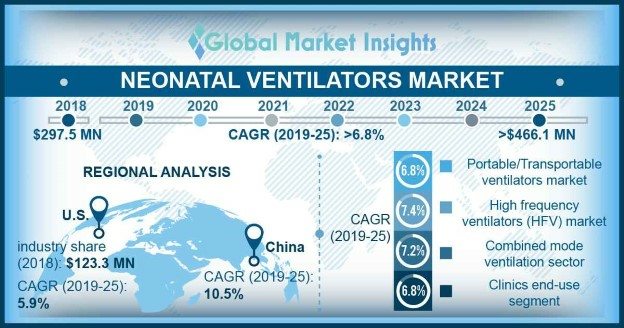 Neonatal Ventilator Market size is set to exceed USD 466.1 million by 2025; according to a new research study published by Global Market Insights, Inc. Rising incidences of preterm births with respiratory disorders and mortality rates primarily drive the demand for various neonatal ventilators worldwide. Technological advancements in ventilators’ design and function are resulting in rising adoption rate, especially in developed regions. Moreover, growing birth rate should augment market demand during projection years. Non-invasive ventilation market was around USD 93.5 million in the year 2018. Steadily increasing acceptance of non-invasive systems will augment industry growth in coming 5-7 years. However, invasive systems will continue to be mainstream interface in many regions worldwide. Efforts by manufacturers and government institutions to minimize the prices of non-invasive ventilators should fuel industry growth. The need to use non-invasive interface for treating preterm birth neonates will prove to be high impact rendering factor on market growth of the same. Intensive care ventilators market is estimated to grow at a robust CAGR of 6.9% over the forecast period. These ventilators provide oxygen to the infant lungs by generating positive pressure. Also, the intensive care ventilators provide safe, effective and lung protective ventilation to the smallest of preterm infants. Hence, the increase in number critically ill infants will foster the demand of ventilators in neonatal care units, fueling the market growth. High frequency ventilators market accounted for around USD 87.9 million in the year 2018. Various advantages such as higher levels of PEEP with conventional ventilation, smaller tidal volumes and fully coordinated volume-targeted conventional mechanical ventilatory modes will augment the demand and adoption rate of the device. Volume mode ventilation market amounted a total revenue of USD 59.3 million in the year 2018. The volume mode ventilation is activated at a preset tidal volume and once that set volume is achieved, the ventilator will cycle off into exhalation. During a volume delivered breath, the doctor adjusts the amount of volume to be delivered to the patient. Ease of use and efficiency provided by volume mode ventilation will boost the demand and adoption rate of neonatal ventilators, augmenting the business growth. Some of the key industry players operating in global neonatal ventilator market are Medtronic Plc, GE Healthcare, CareFusion, HAMILTON MEDICAL, Phillips Respironics, Smith Medical, Breas Medical, Drager Medical, ResMed and MAQUET. The industry participants focus on new product developments, mergers and acquisitions and geographical expansion to increase their foothold in the market and gain competitive advantage.